Soil and produce, Fertilizers, Crop Rotation, Tobacco, New Husbandry, The Hessian Fly, Tools. Information taken from from a historical sketch of the St. Patrick's Church by Margaret Wixted, John V. Horgan, Paul C. Ringgold. In 1875, Patrick MacDonald, who was a successful farmer and whose home just south of the church was also the site of early Eucharist celebrations. Thomas Ryan was the most successful farmer, owning at his death in 1903, over 250 acres of land on Church Hill and over into Hopewell. On most of this he grew onions, a crop successfully marketed in Southport by many local farmers. Several farm families in the early days sold butter, eggs, chickens, and vegetables in Bethel, driving in by horse and wagon, once each week. Although there were a number of Catholic families in Redding by 1850, few were property owners and most rented small houses, generally from the farmer for whom they worked. It took years of saving to buy some land. Often the young men and women were apprenticed to work on nearby farms, for their "board and keep." Wages, if any, were miniscule, but most managed to buy some property eventually, something which would have been impossible in the landlord-tenant system of Ireland. "The soil is various in different parts of the province in some black, in others brown, and elsewhere red, but all rich. Some plains are sandy and of a whitish colour, and they produce rye, beans, and Indian corn. The meadows and lowlands are excellent pasturage, and yield great crops of hay. The hills and uplands have a rich, deep soil, but are subject to droughts in July and August, which in many places are relieved by water drawn from rivers, ponds, and brooks, in troughs and ditches. The crop of European grain are always good, when the snow, which in general is the only manure, covers the earth from December to March. One acre generally yields from twenty to thirty bushels of wheat; of Indian corn, from forty to sixty bushels on even land, and from thirty to forty on hilly land; but it is to be observed, that one bushel of it raised on hilly land weighs thirteen pounds more than a bushel raised on river land. All European grains flourish here, and the grass is as thick, and much longer than in England. Maize, or Indian corn, is planted in hillocks three feet apart, five kernels and two pumpkin seeds in a hillock; so that, if the season prove favorable, the beans and the pumpkins are worth as much as the corn. If from an acre the crop of corn be twenty bushels, add beans and pumpkins, and it will be equal to sixty bushels; so, if there be sixty bushels of corn, a proportionate growth of beans and pumpkins will render the product equal to one hundred and eighty bushels. One man plants an acre in a day; in three he hoes the same three times; and six days more suffice for plowing and gathering the crop. For these ten days' work the price is thirty shillings; and allowing thirty shillings for the use of the land, the whole expense is two pounds, and no more, while the corn is worth two shillings a bushel. The gain is seldom less the 300, and often 600 per cent. It is thus that the poor man becomes rich in a few years, if prudent and industrious. The face of the country resembles Devonshire, Gloucestershire, Surrey, and Kent. The farmers divide their lands into four, five, and ten acres, with stone walls or post and rails. The roads from north to south are generally level and good; from east to west hilly, and bad for carriages. The various fruits are in greater perfection than in England. The peach and apple are more luscious, beautiful, and large; 1000 peaches are produced from one tree; five or six barrels of cider from one apple tree. Cider is the common drink at table. The inhabitants have a method of purifying cider by frost and separating the watery part from the spirit, which, being secured in proper vessels, and colored by Indian corn, becomes in three months so much like Madeira wine, that Europeans drink it without perceiving the difference. They make peachy and perry, grape, cherry, and current wines, and good beer of pumpkin, molasses, bran of wheat, spruce, and malt. The spruce is the leaves and limbs of the fir tree; their malt is made of maize, barley, oats, rye, chets, and wheat. The pumpkin, or pompion, is one of the greatest blessings, and held very sacred in New England. It is a native of America. From one seed often grow forty pumpkins, each weighing from forty to sixty pounds, and, when ripe, of the colour of a marigold. Each pumpkin contains about 500 seeds, which, being boiled to a jelly, is the Indian infallible cure for the strangury. Of its meat are made beer, bread, custards, sauce, molasses, vinegar, and, on thanksgiving days, pies, as a substitute for what the Blue Laws brand as anti-Christian minced pies. Its skin, or shell, serves as a cap to cut hair by, and very useful lanthorns. *The following was taken from www.mountvernon.org/pioneer/lite/farms a web site dedicated to George Washington's accomplishments in farming. The information listed below, describes in great detail the methods and processes used by George Washington and the farmers of his day. Unfortunately, there are little to no records available on the exact methods used by Redding farmers, however, it is my belief that the methods used by George Washington were similar those used by the farmers here. Two hundred years ago, Washington and other farmers of his day knew nothing about soil chemistry or the biochemistry of plant nutrition. Jethro Tull, a leading agriculturalist of his day, believed that plants had tiny mouths on their roots which ate the foods in the soil. Tull and others observed that plants grew better in loose soil, rather than heavy, compacted soil. Tull's "tiny mouth" theory was a pioneering attempt to explain why this was so. He thought that perhaps loose soil fit better in the plants "mouths." If his theory was correct, then loose soil was the key to better crops. The soil could be loosened through two major methods: 1.The use of farm implements, or tools, such as plows and harrows; and 2.The use of manure or other fertilizers. Through constant experimentation, Washington concluded that cultivation and soil "amendments" were both essential to better harvests. What kinds of fertilizers did Washington use? The organic content of animal manure improves the soil, and its nutrients make it a natural fertilizer. Washington built one of the earliest stercoraries, or dung repositories in America. Manure fermented there until it was ready to spread on the fields. Washington also began the process of using fencing to pasture animals on grass fields to provide manure in the fields and to fatten his livestock. It is believed that Washington was using the dark mud from creeks, which is high in organic content, and which would have benefits similar to manure. These provided nutrients and organic material as they decomposed in the soil. Dictionaries and encyclopedias of Washington's time describe marl as chalky clay. Chalk is calcium carbonate, or lime. Today, lime is applied to soil to lower acidity, creating a more favorable soil environment for many crops. Plaster of Paris is still chiefly made of calcium sulfate, which is also known as gypsum. Gypsum is still used today as a soil amendment that loosens heavy, clay like soil, without changing the pH balance. Gypsum also adds calcium and sulfur, important elements for plant growth. Buckwheat, clover, and peas were plowed under by Washington to replenish the soil. Today, we know that these crops helped add nitrogen to the soil. Washington understood through experimentation, that plowing under "green manures" helped improve the productivity of his soil. At a time when most plantation owners were depleting their soil by overplanting, George Washington devised a method of crop rotation designed to improve the long-term productivity of his land. By rotating crops, Washington and other farmers of his day believed that fields would not become "exhausted" or the soil depleted of nourishment. Washington coupled his crop rotation with the use of fertilizers and new planting methods. Washington was not the first farmer to use a crop rotation plan, but he was one of the earliest to develop and apply extended plans, some involving seven-year rotations of several crops, which emphasized restoring the soil as much as production. This is an example of one of General Washington's crop rotation plans. The first year, he planted wheat. The second year he planted buckwheat for green manure, plowing it under. The third year he again planted wheat, followed by three successive plantings of grass and clover. While the land restored itself, he used the pasture to fatten livestock . The final crop was usually corn and potatoes before the schedule was repeated. No crop, except for grasses, was planted in the same field two years in a row. As you can see, four years of each schedule was planned to rest or restore the fields. For many years, tobacco was George Washington's main cash crop. Like other farmers of his day, he grew large quantities of tobacco for sale in England and Europe. By the late 1760's, however, Washington had became frustrated by the system of selling and exporting tobacco which entailed extra fees imposed by England. The market price for tobacco fluctuated greatly, and American planters also found themselves dependent upon factors, or agents, in London to handle their business. The crop was also very labor intensive to produce and quickly depleted the soil. The trend by many farmers was to use the land until it could produce no more and then to move on to western lands. Washington was opposed to the practice of using land until the soil was unproductive and then clearing more fields. By the mid-1760's, Washington decided to make wheat his main cash crop. England was still a primary market, but the crop could also be sold in the West Indies as well as home in Virginia and Maryland. If prices were bad, the grain could always be used to feed his family, slaves, and livestock. Wheat was less labor intensive to produce and allowed the slaves to be employed elsewhere on the plantation. Coupled with his careful crop rotation plan, Washington hoped to ensure that the Mount Vernon lands would remain productive for years to come. By using many of the principles and practices of the "new husbandry," George Washington re-made his farming operation at Mount Vernon. He began to grow wheat as his main cash crop, experimented with the use of fertilizers, grew corn and potatoes for his family and slaves to eat, and grew buckwheat to plow under to improve his fields. He also developed a sophisticated 7-year crop rotation plan, and changed his plowing to reduce erosion. Through his experiments and new farming practices, Washington was trying to farm in a way that would restore the productivity of the land and provide a steady, reliable source of income. Plowing only the top few inches of soil. Deep plowing of 8-10 inches to mix topsoil and subsoil and frequent harrowing to keep soil loose. Use of fertilizers to improve the texture and make-up of the soil. Seed sown by scattering it on tilled soil. Planting or "drilling" seed in holes or furrows laid out in regularly spaced rows for better weeding and for inter-cropping with other crops to make fields more productive. Hand hoeing to control weeds. Cultivators drawn by animals between rows to remove weeds. Resting land by letting it lie fallow, or unused every few years. Restoring land by planting grasses and clover on fallow fields on which animals grazed helped fertilize soils. In the late 18th century, the Hessian fly was perceived as a major threat to wheat crops across the northern eastern seaboard of the United States. The larvae of the fly sucked the juices from green wheat and ate the leaves, ruining the plant. The fly first appeared on Long Island and was given its name because many people thought that it had been brought to this country by Hessian soldiers who fought in the American Revolution. Due to the problems caused by the fly, many American farmers stopped growing wheat altogether, which George Washington thought was a mistake. In December, 1789, he wrote to Samuel Powell advising that farmers grow yellow-bearded wheat which was more resistant to the ravages of this, otherwise, all conquering foe. Throughout his life, George Washington searched for ways to improve his field preparation and crop processing. He continually experimented with the latest technology in farming. When he was unable to find tools to suit his needs, he took the initiative to adapt machines already in existence or to invent his own machine. He invented a plow, adapted a barrel seeder, and designed a machine to sow turnips. Perhaps his biggest and most innovative design was the 16-sided treading barn that he designed and had built at his Dogue Run Farm. As a proponent of the new husbandry, Washington believed in the methodical cultivation of soil before planting. New husbandry encouraged extensive cultivation, which led to the use of more sophisticated tools and implements. Cultivating basically means preparing the soil for planting and caring for the growing plants. Tools used in the process were designed to turn and loosen the soil, break up clods, and create level fields for planting, as well as spread fertilizer, and weed. What tools did George Washington use? A cultivator was a broad, shovel-shaped plow pulled by a horse or mule between rows of growing plants to loosen the earth and destroy surface weeds. A harrow was a wooden frame with projecting spikes. As it was pulled over a field, it broke up clumps of dirt left after plowing. It was also used to drag dirt over newly sown seeds. Have you ever used a hoe in your garden? Hoes were used by Washington and other farmers to cut up weeds and prepare soil for planting. Hoeing breaks or divides the soil while plants are growing. Hoeing before and after planting produces a better crop because weeds are destroyed and the soil continues to be replenished. The shovel plow was used between rows to create furrows between the growing crops, and to destroy weeds. Spikey rollers were wooden rollers with spikes of iron. The machine had a seat placed on top from which a "driver" directed a team of strong oxen. Oxen were needed to pull the machine because it weighed almost a ton! One of the main purposes of this tool was to further break up clumpy soil to make it finer for planting. This tool worked better and was less labor intensive than hand hoeing. Washington designed a barrel seeder to allow for planting seeds in regular rows. The machine was actually a combination plow and seeder. The seed was placed in a revolving cylinder, perforated with holes, which was pulled along behind the plow. As the barrel revolved, the seeds were shaken out through the holes. Through experimenting with the process, Washington amended the design so that the bore of the holes in the barrel were funnel-shaped making it less likely for the seeds to jam. He also was very specific in his directions that the barrel must not be too full or the seeds would block the holes. Dung forks looked like long pitch forks. They were used for spreading dung, or manure, over fields to fertilize the soil. Used to harvest wheat and other grains, cradles were cutting tools with rods or "fingers" attached to a scythe. They were swung in a back and forth motion to cut grain crops. The fingers caught the crop as it was cut, allowing it to be gently placed on the ground in a loose pile. In this way, not as much of the grain was lost during cutting. This was a hand-powered fan that blew the chaff and other light trash out of wheat after it had been threshed or treaded. Flails were hand tools used to thresh grain. They consisted of a long wooden handle attached by leather straps to a shorter, stouter stick that could swing freely. While holding the handle firmly, the shorter end was swung down to beat the grain. Rakes were used for gathering cut grass and hay. Rakes were also used to gather cut wheat so it could be bound. A long curving blade attached at an angle to a short handle. Reap hooks were cutting tools used for harvesting wheat, rye, and other grains. A large wooden scoop-like shovel which was used to collect grains of wheat from the treading area and put them in storage barrels or bins. The shovels were made of wood rather than metal so they would not create sparks which could start a fire. A riddle was a coarse sieve used to sift chaff and debris out of threshed grain. * Here ends the information compiled from the George Washington site. The Connecticut Agricultural College owned a farm in Redding? Georgetown, Conn. March 6- Announcement was made here tonight of public bequests totalling over $250,000 provided for in the will of Edwin Gilbert, President of the Gilbert & Bennett Manufacturing Company, who died last week in Crescent City, Fla. The "model farm" given to the Connecticut Agricultural College, is to get $60,000; Northfield Seminary, Northfield, Mass., $25,000; Mount Hermon School, Mount Hermon, Mass. $25,000; Georgetown Public Schools, $15,000; Life's Farm at Branchville, $15,000; and Tuskegee Institute, Tuskegee, Ala. $10,000.. Please keep in mind these articles were likely written without the knowledge of the Connecticut Farmer information quoted above. One hundred years ago there was in almost every house a loom for weaving cloth. The women of the home wove the woolen and linen cloth used in those. One day, Post Bennett brought home from Bridgeport a quantity of what he called cotton yarn. He asked his wife if she could put up a warp on it on her loom and weave him cloth for shirts. She wove the cloth and made it into shirts and other articles of clothing. This was the first cotton cloth ever woven in the state. The Perry family were all weavers-the first wire cloth made in this country was woven in Isaac Perry's shop(he was the brother in-law of Post Bennett) for Gilbert & Bennett Co. in 1836, on a cloth loom. Isaac Perry and his son George were both weavers. The shop stood back of his house. this was the beginning of the great wire cloth industry of Gilbert & Bennett Mfg. Co. of Georgetown. In the year of 1816, known as the year without a summer, the Post Rider wore his coat all summer. The Perry and Bennett homes stood on the south slope of what was known as Zion's Hill, now known as Goodsell's Hill. Their land was originally part of the Drake and Applegate long lots. It is now part of the Gilbert Agricultural School Farm. In 1906, Edwin Gilbert, a Georgetown philanthropist/industrialist, left to Storrs College (forerunner of the University of Connecticut) his spacious farm lands of more than 300 acres on the tip of the hill overlooking the town (the eastern part of Georgetown). With it he also left all his live stock implements and tools. His will provided that this agricultural experimental station should be maintained and supported from the shares of capital stock from the Gilbert & Bennett Co., which he headed at the time of his death. Unfortunately, the distance from Storrs made the operation of the farm by the college impractical, and it was only operated as a school of instruction until *1909. The trustees of Storrs, Connecticut College and University of Connecticut, successively, have found the property to be a white elephant on their hands. Steps were eventually taken in the *1920's to dissolve the trust. *According to the Connecticut Farmer the farm was in operation after 1910. The exact date/year the trust was dissolved is not known. Two years after the college discontinued instruction at the farm, in 1925, Wesley Robie of Wilridge Road, revived the farm and sold dairy products to local residents. "I did most everything, milking, feeding, and various other things," said Mr. Robie, and he was usually up at 4:30 in the morning. He ran the farm until 1946. Remnants of the buildings reflect Gilbert Farm's history. A large barn, a mess hall for the college, and a grey dormitory are slowly losing their identity as anything but piles of rotting lumber and crumbling foundations. A small barn remains, barely withstanding a weathering of 71 years, and in the middle of the meadow lives Harold Raynor in his 50 year old farmhouse, which remains in good condition with a spectacular view. Also, there was once a watertank, said Mr. Raynor, but it burned down one winter when someone started a fire underneath it to thaw it out. Mr. Raynor first saw his house from the air in 1948. It was a "terrific place" to land his small plane and proved to be a terrific place for other pilots to drop in. The land was sold in 1946 to Wetz & Zerweck Corporation in New York, who agreed to rent the farmhouse to Mr. Raynor. As an aerial photographer, he used the meadow as an airfield and his home for his business of photogrammetry, the skill of applying measurements to photography. "I used to fly a big Stenson" and, thereafter, flew "a Cessna out of here" said Mr. Raynor. "In the wintertime I pushed it up against a back window (to warm the engine) to get it started in the morning. Occasionally, small planes would land in Mr. Raynor's field, in an emergency or so his pilot friends could drop in for breakfast. On another occasion two young people flew across the Sound, lost their bearings, and landed in Georgetown. They were convinced they were over the Catskills, Mr. Raynor recalled. "Instead of going along the coast they started inland." he said. Unable to take off again, the two aviators had to leave their plane in the field until the hay was cut. One night in the mid-1950's around 8, while the Raynor's were watching television, they heard the sound of an aircraft. This one had run out of gas and it landed next to the house. Eventually that plane was dismantled and removed. Around that time Mr. Raynor and his brother drove cars onto the field one night to shine headlights for a plane which was obviously making an approach. The plane skirted safely between the two cars, but the pilot did not see the lights, said Mr. Raynor. Mr. Raynor hasn't flown in 20 years and hasn't had any visitors from the air in 15 years, but he can recall other stories about aviation in his backyard. The next land transfer was in 1973 by Welt & Zerweck to the Las Olas North Company whose principal partner is John R. Bartlett, who is also developer of the adjacent Fairview Farms. The total area was 255 acres, 87 in Weston and 168 in Redding (including Gilbert's Farm). In 1967, 125 acres of the Redding land were zoned for industry. The meadow now bears the tire tracks of trucks; the first physical sign of Georgetown Properties' construction of Glendinning's corporate headquarters and development of five other lots for corporations to rent. Georgetown Properties bought the property in 1978 and Paul Branch, Glendinning spokesman, said that construction of the interior roads is scheduled for early November. He said the company has also to work on lease contracts for other companies, although he would not mention which ones. At this point in the progress of the project it is "a question of odds and ends and back and forth." said Mr. Branch. Mr. Raynor will continue to live at his home despite the construction on the property. He felt that Glendinning was a "nice outfit for Redding to have...It will be an asset to the town." "...He (Edwin Gilbert) also *founded and left a good endowment to the Fresh Air Farm, later known as Life's Farm. The superintendent of that farm, Rev. Ursinus O. Mohr, a former pastor of this church and his wife, for most of the time since 1899 were in charge of this work which gave a two week outing to about 1200 poor city children every summer." *It is not clear whether or not Edwin Gilbert founded what would become Life's Fresh Air Camp. John Ames Mitchell founded the Life's Fresh Air Camp. Gilbert did include the camp in his will. The above information was forwarded by Pastor John Cardamone of the Georgetown Bible Church. I was fortunate to have walked the farmland of Mr. Gilbert in 1996 which is no longer possible as it is now the Meadow Ridge housing community. This land, a place my grandfather once played football and basketball in his childhood, and worked at for a summer in his adulthood, still contained rotting pieces of farm equipment in 1996. It appears that the war ended plans for the farm, however, my grandfather has told me numerous stories of times spent there both working and playing. Recently he told me that up until 1925 the farm also provided water to the village of Georgetown. My grandfather remembers that the Robie family that acquired the farm following the agricultural college's stay, a man named Carl Lundstrum owned a bi-plane and used the farm as his personal airport. He would offer rides in it to children in the area, doing fly-byes over Redding and for lucky individuals a lengthier ride to Danbury Airport. It was not until reading Valie Bannister's article that I learned of Mr. Raynor and his aviation adventures at the farm. A special thank you to Paul Scribner of Georgetown, Besty Pittman, the historian for the Agricultural College at Storrs, Pastor John Cardamone The Georgetown Bible Church, Mr. William Robie, now of Williamsport, North Carolina and John Sturges of Wilton, CT for providing the articles and pictures of the farm. Farming, once a common way of life in Redding, has all but disappeared today. Traces remain. Old foundations, and propery line walls, remnants of old farming equipment, forgotten and rusted, are found throughout the town's woodland areas. But the old ways are not entirely gone from Redding. New Pond Farm Education Center on Marchant Road and Warrups Farm on John Read Road are evidence that farming has not totally disappeared from Redding. Sam and Betty Hill, owners of Warrups Farm off John Read Road in Redding, recall that their 300 acres of rolling pastoral countryside was originally part of a larger 1,000 acre farm, owned by John Read, for whom Redding was named, and an ancestor of the Hills. The farm, known back then as Round Hill Farm for the unique round shape of the hill in front of the main farmhouse, was later renamed Warrups Farm after Chickens Warrup, the Indian chief from whom Colonel Read obtained the land. The farm came into the possession of the Hill family as a wedding gift. When Jabez Hill of Easton married Colonel Read's daughter, Betsy, they inherited this land. Then, when their son John Read Hill, married also, he was given 300 acres of that land to farm as a wedding gift. Warrup Farm has remained in the Hill family for more than 100 years. Well, almost a hundred, the Hills said. There was a brief 22 year span when the family lost it to outsiders. Mr. Hill's great-grandfather, William H. Hill, foolishly invested in gold stocks and went bankrupt, losing the farm in 1907 to public auction. Framed and mounted on the wall of what was once the carriage house and a hayloft, now the Hill's farm office, is the original auction notice dated March 27. It wasn't until 1929 that Mr. Hill's grandfather bought the farm back for $100,000. "That was a lot of money back then," recalled Mr. Hill. "All the old-timers in town said that Ernest had more money than brains," Mr. Hill said. "Did it for pure sentiment I guess." But the Hill family, who lived in New Rochelle, N.Y. at the time, didn't move to the farm immediately after the repurchase. "The plumbing was pretty rudimentary" recalled Mr. Hill. Bathrooms were added to the main farmhouse in 1938. Then a new living room wing was added. Still the Hills only used the Redding farm as a summer escape place until 1960 when they moved in for good. Today, a new generation of hills runs Warrups Farm; Bill Hill and his wife, Laura, assisted by the Hills' second son, Bob. Bill and Laura Hill also live off John Read Road, about a quarter mile past the farmhouse, in a brown saltbox style house near the barn. After graduating in 1977 from Ohio Wesleyan University, the same college attended by his father and grandfather, Bill Hill returned home to manage the family farm. A botany major, he yearned to apply his studies to his work and soon pumpkins, beans, lettuce and flowers replaced Scottish Highlander cattle. Today only four of the long-horns remain along with one old Guernsey that someone gave the Hills, 100 chickens, a few geese, and 10 turkeys raised for Thanksgiving. With the current customer list of 2,000, the Hills sell hay locally year round. In February the trees are tapped and the resulting maple syrup is sold to customers in March. In the summer months they sell fresh vegetables (pick your own except for sweet corn), homemade jam and cut flowers. Up on the ridge, a large tract of farmland still remains much as it was, starting at the four-way stop on Route 58 for approximately 100 yards on the left and to the right as you make your way down Cross Highway starting at the church all the way down to the Boys and Girls Club. In 1867 the land was owned by E.A. Sanford and W. Couch, a Post Office, store and hall were located and perhaps operated by Mr. Sanford at the corner near the four way stop (these buildings burned in a massive fire May 12th, 1879 according to Margaret Wixted). Further down Cross highway on the left 50 yards past the blinking light (owned by Geo. Osborne) is another tract and still further down Cross Highway in the valley is a large piece of farmland that covers both sides of the road abutting the Little River (H. Sanford owned this tract). Lonetown Road, with a rich history of farming has in addition to Warrups farm( W.H. Hill's land in 1867), several open fields just past the Redding Country Club (Land owned by B.B. Reed, 1867)which can be seen from the road up just before the turn-off to Putnam Park Road. Let's hope they remain undeveloped and beautiful. This hill owned by J.H. Lounsbury at the time may be the ridge C.B. Todd describes Tom Warrup living on in his 'History of Redding'.The Lonetown Farm just past the Elementary school on the left is a historical site that is still farmed by town folk today. Umpawaug Road is another great area to explore. On top of the hill just up from New Pond Farm(a real working farm and great place to visit with children) is a large open area that now has mostly been developed, however, provides an insight to the layout of these colonial farms. One can imagine perhaps, the spaciousness of the farms by simply strolling through what is left, observing the fields sectioned by stone walls, and admiring the large trees that have grow along their boarders. This is important to do as we are losing a large amount of land to development each year despite the efforts of the Open Land Commission. Umpawaug Hill was settled about 1720 by several families from Fairfield and Norwalk, who followed the "path" from Norwalk to Danbury, over this hill, and on through what is now Bethel, then to Danbury which had been settled earlier. One of the earliest deeds for this area was recorded in Fairfield in 1728, Vol. 4, Page 344 of the Fairfield Land Records. It read in part, I Ezekiel Sanford, of the town and county of Fairfield, in consideration of the natural love and affection I have for my sons Joseph, Lemuel and Samuel Sanford, (do give) as part of my estate, a parcel of land lying in ye peculiar between Fairfield and Danbury at Umpawaug Hill, so called.....two hundred acres" (this was unclaimed land, and there was not yet a town of Redding.) He also said, "To Joseph, I give one quarter part of 200 acres, which I value at 115 pounds; To Samuel one half of 200 acres which I value at 230 pounds; To Lemuel, one quarter of 200 acres, which I value at 115 pounds, excepting ye house which lay son Joseph hath built on some part of ye 200 acres at his own cost, which my other sons namely Lemuel and Samuel shall have no right in." This house appears to be still standing, on the present Station Road. However, the three sons bought more land nearby and eventually owned most of the north end of Umpawaug Hill. They also built houses. Joseph had married Catherine Fairchild in 1724. His first son, Nehemiah, was born in 1725. His other children were Elnathan, Phoebe, Ann, Timothy, Joseph, Nathan and Stephen. In 1773, Nehemiah was living in the house on Station Road, which presumably had been built by his father, Joseph. That year, he sold the house and farm to Aaron Barlow, a brother of Joel Barlow, the author and statesman. Aaron Barlow had married that same year, Rebecca Sanford, daughter of Elnathan Sanford, who lived nearby. He built a grist-mill on the Saugatuck River. Rebecca's sister, Lucy Sanford (1759-1814) married David Starr, a neighbor, in 1778. This Starr family first appears in Redding in 1772, when Thomas Gold of New Haven sold 195 acres to David Starr of Danbury (Vol. 1, Page 213, Redding Land Records). This deed was as follows:"To David Starr of Danbury, 195 acres at Umpawaug, bounded beginning at an ash tree by a pole by the south side of a small brook, and on the west side of the highway leading to Norwalk, said pole being the southeast corner bounds of Gold's land; thence south and bounded by said highway to the highway in Ridgefield." This is obviously the intersection of the present Merchant Road and Umpawaug Hill, the present Carmen Matthews property. An indication of: the age of the present house appears in a deed dated 1779, when Elnathan Sanford sold to Aaron Barlow, five acres of land described thus: side of the highway that leads from David Starrs to John Picketts said land bounded beginning at stones on the north side of the highway by my own land, 44 rods to stones; west by my own land 20 rods to stones by the land of Timothy Sanford; south by Timothy 36 rods, to stones by the highway; east by the highway 20 rods to the first bound." So David Starr built his house between 1772 and 1779. This is also verified in a deed dated 1802, when Starr gave Peter Sanford a right-of-way to pass "from the highway vest of my dwelling, to land Peter bought of me, lying to the north end of my few with cattle horses and carts, when Peter hath crops on his north lot that he bought of Huldah, wife of Timothy Olmstead, of Ridgefield providing he shall put up the fence when they pass through. In 1807, David gave his son,David 2nd and his wife Lucy, 21 acres of land adjoining homestead. It is possible that David built in another house on this land for him family of six children who were Eli, David 3rd, Comfort, Anne, Aaron and Elnathan-Sanford Starr. There is no mention of such a house which may have been torn down at some point. Abigail wife of David, died in 1806. Meanwhile, Daniel Barlow, the son of Aaron and Rebecca (and nephew of Lucy Starr), had been buying property in the area. He soon acquired the property and the Starr house from Isaac Meeker, and made it his home. Following the death of Daniel Barlow in 1850, the Probate Court awarded to Daniel's son Joel, 98 acres with the barn and cow house. Daniel had given Joel, in 1827, 8 acres and buildings, apparently the homestead. Joel Barlow, son of Daniel and Sarah Dimon, born in 1800, died in 1860. He had married in 1821, Deborah Sanford, born in 1803, daughter of Ephraim Sanford of the Sanfordtown branch of the family. They had eleven children. Joel died in 1860. Deborah died in 1885. In 1866, the heirs (none living in Redding) agreed to sell the real estate of their parents. In 1890, a man named Henry Wallbridge of Danbury bought 125 acres and buildings for $3,500. However, he lost it to foreclosure in 1899 to James L. Blackman. who owned the old salt-box house on Station Road and still operated the grist-mill. 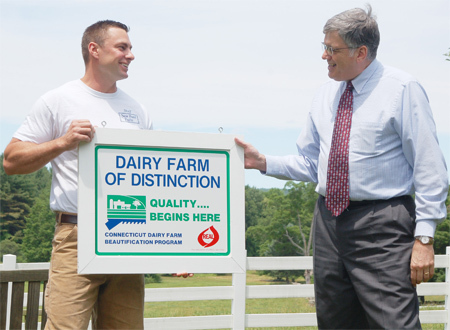 Governor M. Jodi Rell announced that the Connecticut Dairy Farm of Distinction Committee has selected New Pond Farm in West Redding as this year’s winner of the Dairy Farm of Distinction Award. F. Philip Prelli, Connecticut Commissioner of the Department of Agriculture, presented the award at a ceremony today. More coverage in The Redding Pilot. More on the Dairy Farm at New Pond Farm. The success of Grandview Farms, known throughout Fairfield County as one of the finest establishments of its type, can be attributed wholly to the efforts of its owner, George P. Williams, who has managed and operated the property with distinction for over a quarter of a century. George P. Williams was born in Bedford, New York, January 9, 1871, the son of Isaac D. and Sarah E. (Waterbury) Williams both residents of his native State, where his father engaged in farming. Mr. Williams received a general education in the public schools of this place and later attended the Bedford Academy from which he was graduated with the class of 1888. During that year he embarked on a business career, securing a position with the A.S. Barnes Publishing Company. He headed the mailing department of this concern and after it was merged with the American Book Company, continued with the new organization for for two years. At the expiration of this period he removed to Brooklyn, New York, where he established himself in a wholesale baking business in a company which he operated under his own name, which is credited with being the first of its type to market paper covered bread. He continued in this business for six years and then went to the State of Massachusetts where he purchased a farm which he sold a year later. It was during this period that he came to Redding and acquired his present establishment, which he has developed into one of the finest in this section. At present (1939) he owns a herd of approximately one hundred and twenty-five cattle, works five hundred acres and leases the remaining five hundred. He specializes in dairy farming and markets his products in Redding, Danbury and Bethel. Mr. Williams is a member of the Danbury and Bethel Milk Association, and the Eastern States Cooperative Association. In 1903, Mr. Williams married Ada Mitchell and they are the parents of eight children: Ada, George, Dorothy, Margery, Samuel, Richard, Elsie and Arthur. I thank former Reddingite Shirley Limot very much for sending me the above information about her Grandfather's farms-all the way from France!! The Grandview farms were located on Route 107 and what is now Wood Road on Sunset Hill. The farm on 107 sat upon the beautiful open field you see to the left just past Dahlia Lane and the farm on Woods Road was then on Sunset Hill (Wood Road came later), the farmhouse still exists. Shirley added that the barn on the Sunset Hill farm was beautifully constructed with exceptional wooden beams. The daily milk route stopped after WWII and the milk was sold wholesale to big distributors. Both farms were sold in the late 50's.